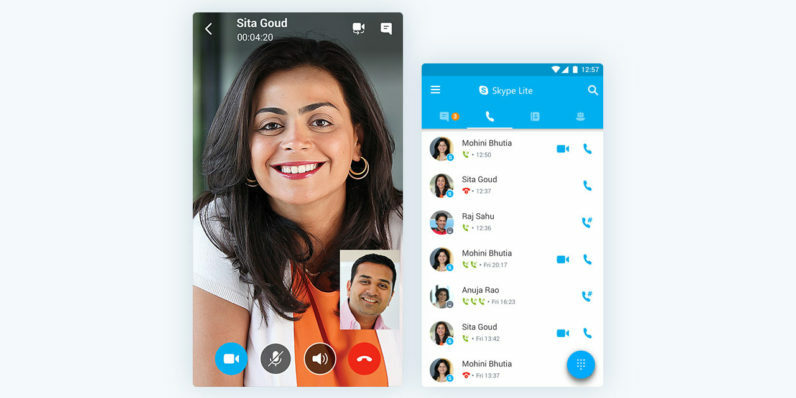 At its Future Decoded event in Mumbai, India, today, Microsoft CEO Satya Nadella announced the launch of Skype Lite, a retooled version of its voice and video calling service, designed for use in areas with limited connectivity on Android devices. The new app takes up just 13MB of space and will support nine regional languages, as well as chatbots for connected services. It also lets you read and reply to SMS messages, and includes a tool to help you track your mobile data usage. There are also chatbots to bring you content like news and sports scores. Microsoft began building out its Skype Bot platform last year and opened it up to developers so they could create their own conversational bots for use with Skype’s messaging service. Other available bots include Expedia and Skyscanner for looking up travel deals. The new app also takes advantage of the India Stack, a bunch of APIs that allow governments and businesses to make their services available securely to Indian citizens. Specifically, it taps into the Aadhaar scheme, which provides each registered citizen with a unique numerical ID with which they can verify their identity. The company demonstrated how this could be used to enable recruiters to conduct employee interviews from a remote location while authenticating the identity of the interviewee. Here’s how it works: Both parties hop on a Skype Lite video call, and the interviewer requests Aadhaar verification. The interviewee enters their 12-digit ID, as well as an OTP sent to the phone number linked to her account. The recruiter is then shown the verified ID information and can proceed with the interview. Once the call is concluded, all verification data is wiped from their device. The free app will soon be available from Google Play; there’s a link to the store page from the Skype Lite site, but at the time of writing, it wasn’t yet live.